UFC 236 has arrived and the fight card is remarkably still in perfect shape. All fighters made weight and that means fight fans will be treated to a brilliant fight card that is headlined by two interim title fights. 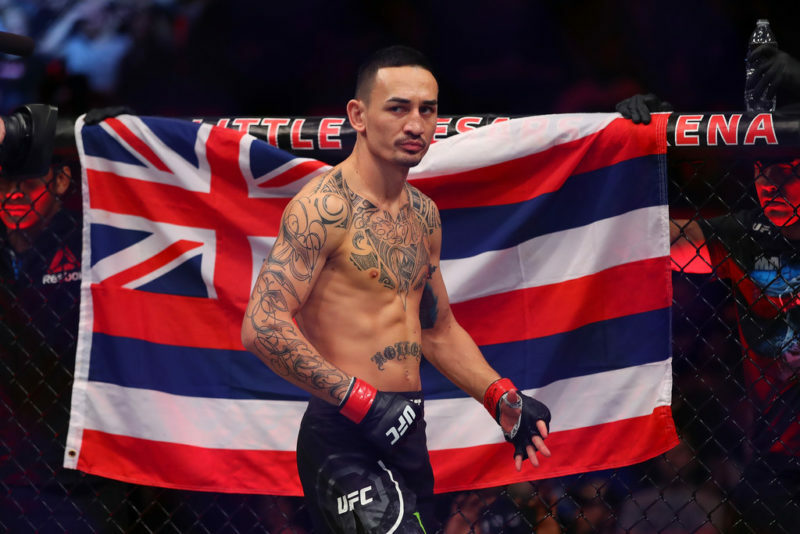 In the main event, Max Holloway slides up to 155-pounds to challenge Dustin Poirier for the UFC Interim Lightweight Championship. 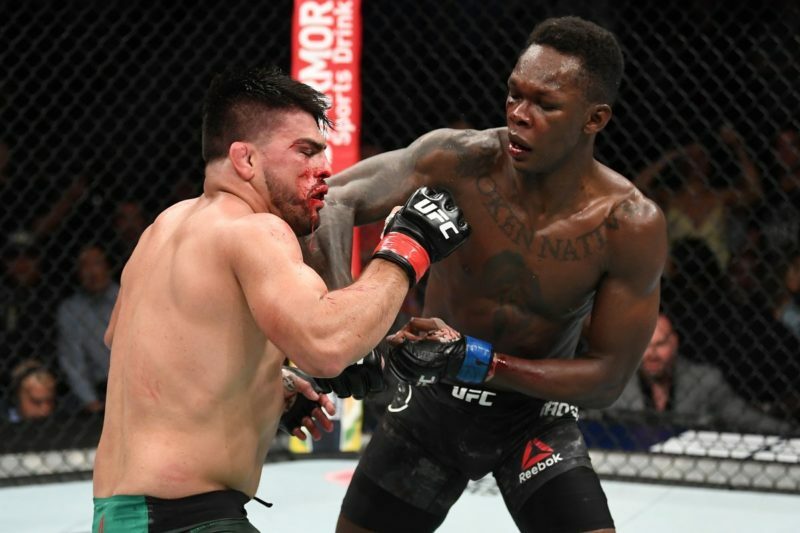 Moments before that matchup, Kelvin Gastelum and Israel Adesanya will go head-to-head in a co-main event that decides the winner of the UFC Interim Middleweight Championship. The pay-per-view main card will be distributed exclusively by ESPN+ in the United States. Follow along below for quick UFC 236 results and a detailed play-by-play that includes full commentary and highlights. Poirier starts by landing a nice leg kick on Holloway. Poirier lands another low calf kick. Holloway advances and targets the head and body with his punches. Poirier cracks Holloway with a brilliant left hand. He rushes forward and attempts to hurt Holloway again but Holloway counters. They reset. Poirier comes out looking worse. Poirier shifts forward and lands a big right hand. He unloads about 20 punches on Holloway but he comes away unscathed. Poirier still tagging Holloway but Holloway is still standing. He’s standing right in front of Poirier and taking all of Poirier’s best shots. Holloway is in heaps of trouble. Poirier steps back and takes a deep breath. Now it’s Holloway moving forward. He cracks Poirier but then stays in the pocket for too long and takes some shots in return. Holloway is on the receiving end of way too many strikes. Holloway hasn’t evaded many of Poirier’s strikes at all. 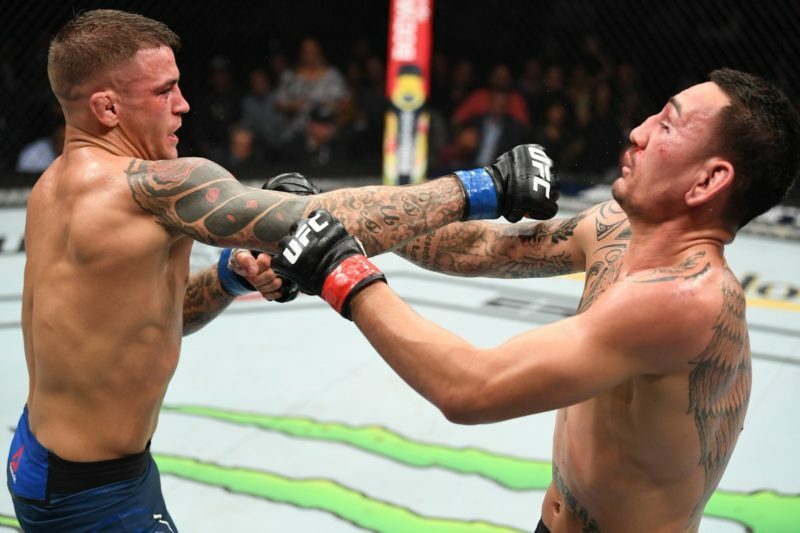 Poirier’s speed, timing, and accuracy seem to be too much for the featherweight champion. Comfortable round to score for Poirier but Holloway remains dangerous. The pace slows a little in round two after both fighters went berserk in the first round. Both fighters are landing their shots now but we feel that this is allowing Holloway to regain his composure and settle into the fight. Holloway now leading the striking exchanges and feinting to open up offensive opportunities. Poirier now not countering nearly as often. Holloway’s starting to step it up toward the end of the second round. Poirier lands some decent shots as Holloway comes forward and then starts to walk Holloway back to the cage. 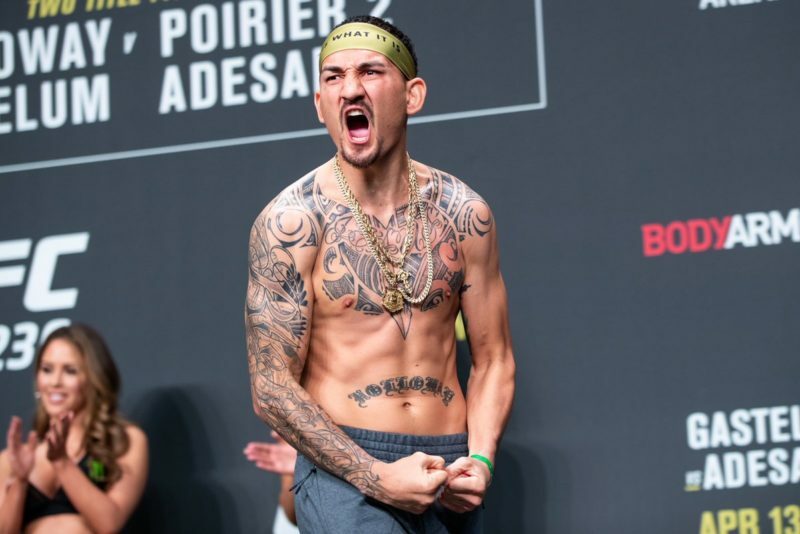 He lands several hooks and gets the classic look from Max Holloway that asks ‘is that all you got?’ Poirier was on the losing end of the first half of the second round but managed to step it up in the end and get that one back. Poirier now starting to work the body in round three. Holloway trying to get his jab going. Straight punches are being deflected by Poirier’s forearms. He’s keeping them high to stop Holloway from establishing the jab and straight. Poirier lands two big strikes, a straight left hand followed by a stiff jab. Holloway gets going now and lands some good strikes but Poirier has the answers. Both fighters are still landing heavy shots. Poirier is landing with more impact and marking up the face of Holloway now. Holloway really turning up the volume with less than a minute remaining. About 20 unanswered punches that are mostly deflected and then ends up with his back to the cage with Poirier attempting a takedown. Poirier’s head is on Holloway’s hip and Holloway rams some elbows into the side of his head. Holloway moves forward and Poirier level changes and gets his first takedown of the fight. Holloway pushes the head down and has his back against the cage. He returns to his feet and turns Poirier around before hitting him with a knee to the body. Holloway tagging Poirier with combinations now but Poirier still landing the heavier shots. Poirier now the one coming forward and he is starting to land more punches. Holloway solid hooks to the body of Poirier. He’s clearly going after the body of Poirier to slow him down. Poirier starts to look impacted by body shots and is showing signs of fatigue. Still very much in this, though. A knee by Poirier busted Holloway’s face up badly. There’s now lots of blood on Holloway’s face. Poirier shoots and Holloway’s back is now against the cage. Stalemate and that’s the end of the round. Close round. We give the edge to Holloway who controlled the opening minutes of the bout. Got it tied before the final round. Nice jab by Holloway lands first. Left jab and right cross working well for Holloway now. 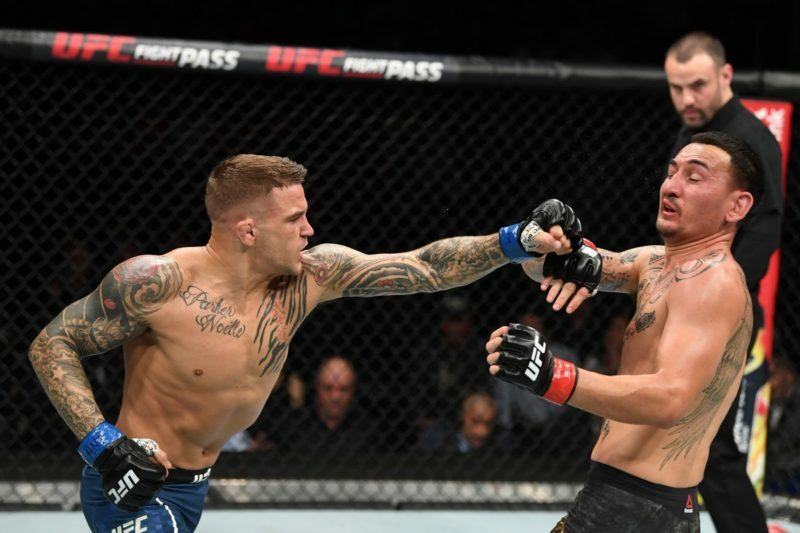 Poirier trying to time his counter punches. Poirier still packing power in his counter left hand but just missing Holloway’s head. Poirier missing with his strikes and Holloway landing but not with much impact. Competitive last round. Holloway throwing more strikes. Walks forward and engages the clinch with Poirier. Poirier turns him and gets him against the cage again. Nothing has happened from this position throughout the fight. Poirier hanging on and Holloway unable to break the grip. Holloway points to the ground and they trade hooks to finish the fight. Crazy. Incredible fight. Kelvin Gastelum comes out and pushes the pace early. He’s composed though and waiting for his opportunities. Adesanya scoots back and maintains his optimal striking range. Gastelum advances and puts heaps of pressure on Adesanya, he catches him with a hook and Adesanya falls backward. Adesanya resets in the middle. Gastelum now working to the body. We’ve never seen Adesanya under this much pressure before. Gastelum catches Adesanya’s left kick and returns a punch but misses. Gastelum’s looking outstanding right now and isn’t allowing Adesanya to settle into his rhythm. Big round for Kelvin Gastelum and that’s a 10-9 start. Gastelum’s causing plenty of problems for Adesanya. He scoots in and lands a right hand on the outside of Adesanya’s head. Gastelum lands a stiff jab that rocks Adesanya’s head back. Adesanya’s trying to up the pressure now but Gastelum landing cleanly. Adesanya seems to be sticking around at close range for far too long, as Gastelum is finding a home for his hooks. Gastelum’s jab is snappy but Adesanya lands a right hand and drops Gastelum. He recovers and they reset. Brilliant fight. Both fighters are taking deep breaths. Adesanya’s now on a roll. He drops Gastelum and he’s starting to show signs of being rocked. Gastelum fires back a left hand but Adesanya’s chin has held up all fight. Gastelum attempts a takedown and Adesanya sprawls and defends. That’s a 10-9 round for Adesanya and it’s now 19-19. This fight is incredible. It was all Gastelum early and now it’s all Adesanya. Adesanya’s been attempting lots of kicks. Most are missing but they occasionally land to the body. It only takes one clean shot to the head to end the fight, however, and Gastelum’s hands are lower than ever before. Gastelum’s doing a good job of slipping punches and moving into the pocket to throw his own strikes. Adesanya’s starting to become more aware of this tactic and is coming up with new answers as the fight progresses. Adesanya trying to fight long but it does feel like he’s vulnerable at close range now. Gastelum shoots for a takedown and secures an easy double-leg. Adesanya scoots back to the cage, pushes off Gastelum’s hips with his feet and gets back up. Gotta be a 10-9 for Adesanya who takes the lead after round three. Gastelum needs to change something. He comes out fast again but misses with his strikes. Adesanya gets it back to his preferred range and works the legs and body. Adesanya moves forward, clinches, and then lands a knee to the body. Low kick has been there all night for Adesanya. Gastelum eats a hard punch and returns his own. Gastelum’s punches are only narrowly missing Adesanya’s head. There’s enough power in them to cause real damage if they land clean. Gastelum now landing his short punches at the end of round four. Adesanya forced to throw higher volume now to keep him away. Adesanya’s face is marked up now. Gastelum with a 1-2 and high kick. Gastelum’s chasing after Adesanya who looks hurt after that combination. Gastelum shoots for a takedown but Adesanya defends. Now it’s Adesanya throwing strikes back at him. Big round for Gastelum who ties it up at 2-2 after a 10-9 round in the fourth. Gastelum again rushes at Adesanya to start the round. Adesanya smooth 1-2 down the middle. Gastelum chases again. Both men have taken heavy shots all night long and are still standing. Gastelum moves forward and Adesanya goes for a high-elbow guillotine. Gastelum spins and gets out of the position and now Adesanya is on his back. He attempts a triangle choke but Gastelum escapes. They’re up again. Adesanya’s now feeling in the zone again but Gastelum pressures and traps him against the cage. Adesanya escapes. Adesanya turns it on in the last minute and drops Gastelum to the floor after a high kick and a hard right hand. Gastelum is bloodied up and rocked. Adesanya attempts to finish but runs out of time. Gastelum was pretty much saved by the bell. Adesanya finishes strong. That’s a strong way to end the bout and arguably a 10-8 round. Absolutely amazing fight and one of the best we’ve seen this year. Rountree comes out showing his new Muay Thai stance. He’s been training in Thailand after his loss to Johnny Walker late last year. Rountree slams some low kicks into the right leg of Anders. We all knew Rountree had been training in Thailand recently but we had no idea he’d come back looking like a Thai fighter. He’s heavy on his back foot and light on his front one. He’s repeatedly tagged Anders’ leg and it’s battered by the end of the round. That should be a 10-8 for Rountree. Rountree drops Anders at the start of round two. He’s lying down on the mat and Rountree is punishing him with more leg kicks. Rountree crushes Anders with a devastating left hook and he falls forward. He allows him to stand back up. Anders shoots but Rountree defends. Rountree advances and lands another massive punch to knock Anders down. Anders is back up and Rountree floors him yet again with a right hook. Crazy. Round two was at least a 10-8 for Rountree. Rountree moves forward and lands a stiff right hand to the head. He looks superb in this fight. Anders is having a better third round, as many had expected before the fight but he has taken too much damage and is too far behind. There’s not much pop left in his strikes and Rountree seems to be taking the foot off the pedal. A 10-9 round for Rountree. Jouban early takedown but Grant scrambles and separates. Jouban misses with a thunderous head kick. Grant moves forward and throws some heavy hands. That continues to be the story of the fight. Grant packs serious power in his hands and Jouban has gained immediate respect for his knockout power. Jouban begins advancing toward the end of the round but is unable to enter boxing range against Grant. That one’s a 10-9 for Grant. Jouban continues to be clipped by Grant’s power punches but has showed excellent durability so far in this fight. He’s been struggling to land his strikes, however, despite controlling the center of the cage. Mostly, it’s just Jouban following Grant around the Octagon and not actually closing the distance. Neither fighter is really landing their strikes consistently in round two. Jouban is yet to attempt another takedown after the initial one in the first round. Closer round than the first because almost nothing happened in the round. We’ll score it 10-9 for Jouban. Jouban starting to swing a little more but misses with some looping hooks early in the round. Still following Grant around the cage and not cutting him off. Grant’s not exactly doing much, either, and has opportunities to close the distance himself. Jouban hits Grant low and the referee calls an injury timeout for a groin strike. That was arguably the best strike from Jouban so far. Fight restarts and Jouban ducks under a Grant hook and returns fire. Jouban still following Grant and trying to land his strikes now. Attempts a takedown and ends up getting the back with just seconds left in the fight. Disappointing fight but Jouban may get the edge after winning the two last rounds. Krylov starts putting the pressure on Saint Preux from the opening seconds. Makes Saint Preux cover up and attempts to land some power strikes. Saint Preux changes the pace and secures a takedown but can’t hold Krylov down on the mat. Krylov stands and attempts a guillotine choke but can’t finish it. Saint Preux gets another takedown now but Krylov again stands to his feet right away. Another takedown but this time Saint Preux slides into full mount. Krylov shows his back and scrambles out of the position. Now he has the Thai clinch position locked against the cage. The blistering pace has seemingly taken a toll on Saint Preux already. He looks tired and Krylov advances to clinch with him. Saint Preux traps Krylov against the cage but Krylov ends up getting the takedown and lands in full mount. Saint Preux gives up his back and Krylov digs both hooks in. Krylov eventually gets the rear-naked choke locked in and Saint Preux taps. Frevola takes the back of Turner and looks like he may slide over the top but recovers a control position with two hooks. Frevola is controlling Turner’s left wrist and pummeling his right arm under the chin. Frevola scrambles and gets back to his feet. Frevola gets a takedown and now ends up in side control. Turner attempts to get back to his feet but ends up in a guillotine submission attempt from Frevola. He survives and gets back to his feet. The two exchange on the feet to finish the round. Turner’s size is having a huge impact on this fight. His length and frame has allowed him to keep Frevola away. As Frevola moved in for a takedown, Turner wrapped him up and locked in another guillotine attempt. This time he keeps a dominant position, though, and now sprawls heavy on Frevola’s back as he attempts to stand. Frevola switches and ends up on top in half guard. As Turner tries to recover guard, Frevola snatches a guillotine that seems like the tightest of submissions so far. Turns gets his head out of the guillotine but receives an illegal up kick in the face/eye from Frevola. Referee Marc Goddard steps in and calls it “innocuous” despite the fact that the up kick clearly landed with impact and hit Turner right in the eye. Frevola starts the round with a low kick and heavy right hand. Turner gets his jab going before landing a nice combination of strikes that backs Frevola up. The two fighters trade heavy punches at close range and a hook from Turner forces Frevola to the cage. Turner is getting the better of the striking in this round so far but he then gives up a takedown to Frevola. Turner again defends the incoming takedown with a submission attempt but Frevola recovers and moves to half guard. Reis clearly looking for the takedown and eventually gets one. Pantoja scrambles right back up, though. Pantoja lands a brilliant right hand that drops Reis to the mat. Pantoja stands above him and lands many unanswered strikes to the head. Referee Jason Herzog gave Reis every chance to get back into the fight but he was unable to do so. A great win for Alexandre Pantoja. Griffin comes out aggressively and lands a heavy right hand. They clinch and then he manages to slam Imadaev down to the mat. Imadaev grabs the fence to work his way back to his feet but the referee steps in and deducts a point from him immediately. Great work by the referee. Griffin landing with his punches now and works Imadaev back to the cage before securing a takedown. Griffin has the back but is unable to secure his hooks to maintain control of the position. He sneaks his left arm under the neck of Imadaev and attempts a fulcrum choke. Imadaev attempts to turn in to Griffin and is able to return to his feet. He starts coming at Griffin but has his first low kick checked. He’s now putting the pressure on Griffin and looks to connect with another spinning attack. Imadaev and Griffin are now engaged in a clinch battle against the cage. Solid 10-9 round for Griffin with a point deduction for Imadaev making that a 10-8. Griffin earns the back early in the second round. Imadaev trying to escape and does. Now they’re clinched against the cage again. Griffin disengages and covers his face as Imadaev swings wild hooks. Griffin attempts another takedown and Imadaev rolls out of it. The majority of the fight has been contested against the cage. They return to the center and Imadaev lands some stiff strikes, including a decent low kick. Griffin gets Imadaev down to the mat again but can’t maintain control. He lands a knee as Imadaev returns to his feet and attempts one more takedown but fails. Imadaev now attempts a high kick and this allows Griffin to shoot for another takedown. Again, he can’t keep Imadaev down. Imadaev had a greater impact during the round despite Griffin’s effort to control the fight. A close round, but we score that a 10-9 for Imadaev. Griffin and Imadaev both slowing down but that hasn’t stopped them from throwing all of their strikes with plenty of power. Griffin’s on the back foot now and Imadaev is pushing forward. Imadaev throwing everything with maximum effort. Another takedown attempt by Griffin but he’s seemingly too fatigued to finish the effort. Imadaev defends and works back to his feet immediately. His scrambling has been excellent tonight. After a period of clinching against the cage, Imadaev dropped down and Griffin landed some heavy knees to the body. The two finish the fight by trading heavy shots in the final seconds. Another close round but we’re leaning toward 10-9 Imadaev due to greater impact again. He landed the heavier shots throughout the final two rounds. We scored the bout 28-28. Khalid Taha walks forward and misses with a right hook but follows through with a devastating left hook that floors Boston Salmon in just 21 seconds. 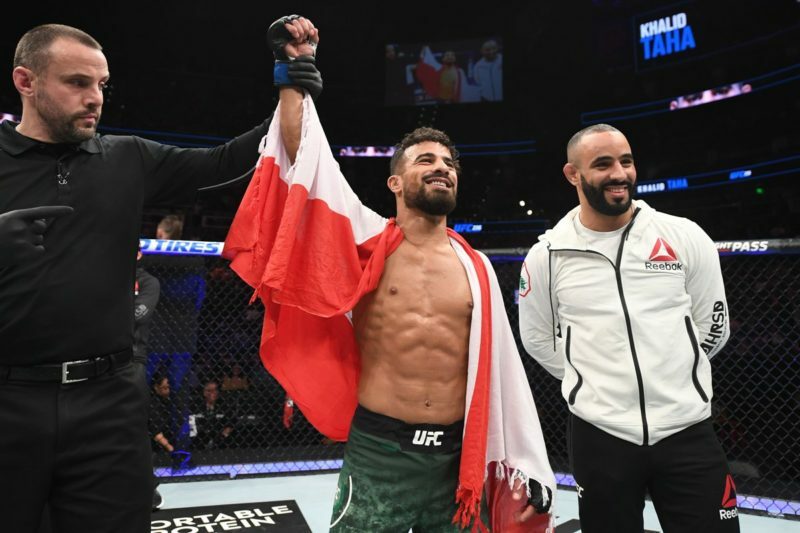 Taha follows him to the mat and then earns a fast knockout victory as the referee steps in. Muhammad starting aggressively and working behind his jab to set up other power shots including his left hook. The jab has been working well for Muhammad early. Millender now seems to be settling into the fight after two minutes. He works upstairs with a jab before coming down with a left hook to the body. High-volume striking fight for both guys so far. Muhammad now closing the distance with a lunging left hook and uses the position to push Millender back to the cage. Muhammad works for a single-leg takedown but Millender shows great balance and takedown defense. Millender lands his best strike of the night: a snappy right hand that lands and he follows up with a body kick. Competitive round that could legitimately be scored for either fighter. Millender’s work was more consistent and seemingly had more impact, we’ll go 10-9 Millender. Muhammad wastes no time and moves forward to get Millender’s back to the cage. Millender defends and resets. He’s been using the oblique kick to keep Muhammad from rushing forward again. When Millender leads, Muhammad does a good job of slipping and closing the distance but he’s not landing with any impact. Muhammad is becoming increasingly creative as he grows frustrated with Millender’s distance management. He then moves forward and secures a takedown from against the cage to land in half guard. Millender hanging on to a far-side overhook and not engaging his legs or hips. Muhammad is able to land some ground and pound as a result. Millender manages to recover full guard but that doesn’t stop the ground and pound. A great round for Belal Muhammad and a clear 10-9. After experiencing success on the mat in round two, Muhammad attempts an early takedown. Millender defends. He needs to keep this fight standing if he stands a chance in this last round. Muhammad comes over the top with a strong right hand. He follows up with another. Millender isn’t the same and Muhammad is only getting stronger. Muhammad secures an easy takedown and begins the ground and pound process yet again. He eventually works to side control and then moves into full mount. Millender attempting to stop Muhammad from posturing up but is unable. He turns his back and Muhammad now has both hooks in. Millender turns again and attempts to stand but Muhammad drags him back down again. Another solid round for Belal Muhammad and this one should be considered a 10-8 due to dominance, duration, and impact. We scored the bout 30-26 for Muhammad. Both fighters start with patience. Soukhamthath is attempting to close the distance by working his jab. Jackson is sitting back and pawing forward with his lead right hand from southpaw stance. Jackson displaying a brilliant ability to control the distance with his long punches. Soukhamthath attempts a right roundhouse kick but Jackson deflects and slams in a left roundhouse kick of his own to Soukhamthath’s body. Souhamthath marches forward with strikes before finding the clinch and landing another strike. He disengages and moves back and Jackson seemingly wakes up and pushes Soukhamthath to the cage. He uses this position to lift Soukhamthath up and then take him to the mat. Soukhamthath returns to the feet. Another takedown for Jackson to end the round on top. A 10-9 round for Jackson but there wasn’t a whole lot of impact. Another patient start to round two. Soukhamthath seemingly struggling to close the distance and land his powerful punches. Jackson’s doing a brilliant job of fighting long to keep him away. Jackson eventually backs Soukhamthath to the cage and starts unloading his best shots. He lands a series of devastating hooks that bring the crowd into the fight for the first time. They now engage in a hand battle against the cage and then Jackson uses Soukhamthath forward momentum to switch and drag him to the mat. He lands in full guard. A strong 10-9 round for Jackson who showed dominance in both the grappling and striking areas. He starts the round with a strong jab and then an unfortunate groin strike that drops Soukhamthath. He takes his injury break before restarting the fight. Soukhamthath is inspired now and charges forward and land some shots but Jackson ends up reversing him during the scramble to end up in a dominant position. He’s landing strikes from the top now. Soukhamthath utilizes the lockdown position from half guard to keep Jackson from posturing up. Jackson attempts to pass and then hunts for a kimura. He lets go of the submission attempt and then unloads some punches to the body. Another dominant round for Jackson so far as Soukhamthath not showing any urgency to get back to his feet. After some ground and pound, Soukhamthath then attempts an armbar before transitioning to a triangle. Jackson easily picks him up and then slams him back down to finish the fight with some more ground and pound. Another very strong round for Jackson that should be scored as a 10-8 considering scoring criteria of dominance, duration, and impact. This fight really showcased all of Jackson’s fundamentals. He does all of the basics extremely well, including using his jab from long range, controlling the distance and using well-timed takedowns to control the fight. We scored the bout 30-26 for Jackson. Poliana Botelho starts by timing the low kick to the calf of Lauren Mueller. Botelho also lands clean with her long jab. A left kick to the liver almost folds up Mueller but she remains standing. Botelho charges forward and pushes Mueller back to the cage where she then secures an easy takedown. Botelho moves to half guard. Mueller secures double underhooks from the bottom but then starts getting crushed by Botelho’s cross-face. Mueller slides out and engages her hips. She comes up and gets to turtle and then stands to her feet. Now it’s Mueller pushing Botelho back to the cage with double underhooks. Botelho turns her and disengages before landing a solid right hook to the head. Botelho is pushing her forehead into the chin of Mueller and keeping her back to the cage while landing heavy foot stomps. A 10-9 round for Botelho that featured two scoring criteria: dominance and impact. Mueller and Botelho clinch against the cage and both fighters continue to turn one another to try to regain control. Mueller lands a heavy punch and that’s her best strike of the night so far. As they disengage Botelho shoots in for a powerful double-leg takedown and secures it with ease as Mueller had her head up and clearly didn’t expect the takedown. Mueller finds herself with two overhooks and butterfly guard but then proceeds to shift back to the cage where she remains comfortable with a version of Z guard. They return to their feet and Mueller has Botelho against the cage but is unable to work. Botelho turns her and starts driving her knee into the thighs. We get a referee separation after nothing seems to be developing. It’s Mueller who is pushing the pace at the end of the round and Botelho seems to be fatiguing. A 10-9 round for Botelho but it wasn’t as dominant as the first round. Mueller storms forward and attempts a double jab but is stopped by a heavy low kick. Mueller starting to land more strikes now as Botelho attempts to catch her breath. Botelho spins and attempts a kick but misses by a wide margin. Now Botelho pushes Mueller to the cage. We get another referee separation as the two slow down in the clinch. Botelho attempts another double-leg and Mueller is very upright but she’s still not able to get the fight to the mat. Mueller defends and turns her to the cage but then we get some stalling. Another fighter separation and that allows Mueller to turn it on. She becomes ultra-aggressive and lands heavy punches and a knee to push Botelho backward. Botelho falls backward to try to bait Mueller onto the ground and she follows her for unknown reasons. Mueller had her best moments just before following Botelho to the mat but was unable to make an impact on the mat. A 10-9 for Mueller who made an impact with her striking at the end of the round. Too little too late. We scored the bout 29-28 for Botelho. Costa clips Davis with some early punches. Attempts to finish but Davis recovers fast. Davis now lifting the pressure and working Costa against the cage. Davis attempts a single-leg takedown but Costa defends. The two walk back to the center of the cage. Costa lands flush with a combination of punches and a high kick. Davis charges in but Costa tags him with a perfect check hook. Costa now pushing Davis to the cage but isn’t able to make an impact. Separates and now Davis is taunting. Both fighters are now trading in the middle of the Octagon but are unable to land with any real significance. Costa lands five consecutive jabs as he backs Davis to the cage and then hammers him with another high kick. Davis turns it on now and lands some of his best strikes of the fight so far. Both fighters exchanging lead jabs. Costa ends the round with a right high kick attempt but Davis leans back and evades. Exciting first round and we believe Costa edges the round due to impact. Costa rushes out and stuns Davis with some heavy shots. Davis is able to clinch and use the position to recover. The fight changes in momentum yet again and Davis overwhelms Costa with a series of strikes. Costa lands in turtle position and exposed his neck. Davis sunk the rear-naked choke and finished by sliding off to the left and not securing both hooks. 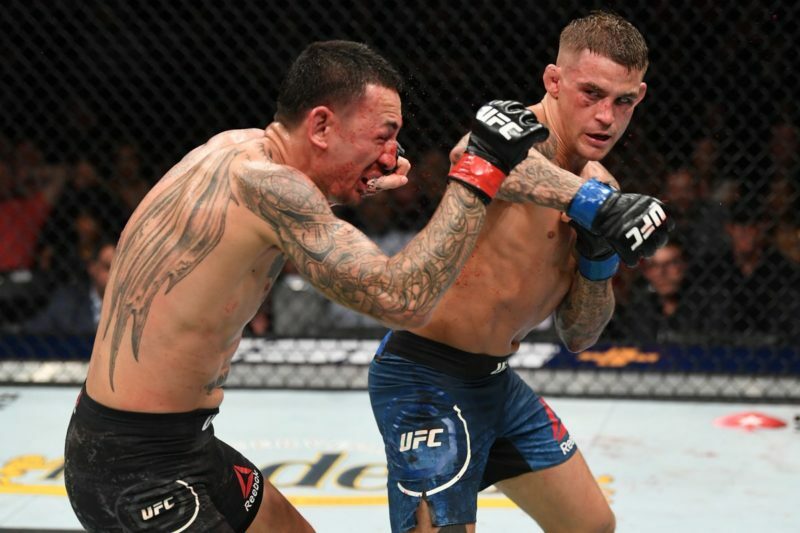 UFC 236: What’s next for Dustin Poirier and Israel Adesanya?